The 12 shorter tales here lack the life-force and zest of McIlvoy’s splendid Hyssop (1998), but the title novella provides plenty. The stories often feel not of a piece tonally, as though they rose from old desk drawers. From flawlessly poetic hymns to a chain letter symbolizing life (“Chain”) and to the Five Blind Boys of Mississippi (“Been So Good to Me”), McIlvoy declines to the mechanical, as in the psychologically thin “Ice” (a nurse “accidentally” blinds an eye to keep a boy out of Vietnam). Poverty can seem at once authentic and too conscious of itself as an engine in pieces like “Smoke” (an uninsured working family’s house burns); “Permission” (about an old magician who long ago performed in jazz saloons); or “Rafters” (the working-class boy from “Smoke” forms an affection for the yet-lower-class, Snopes-like, side of his mother’s family). Everything changes, though, in the novella, made up of three 1965–66 term papers written by the ineffably charming Charlemagne (“Chum”) J. Belter for his teacher, Mrs. Dorothy Bettersen, the first paper in the fifth grade, the second in summer school (he failed fifth! ), the third in sixth. Each one comes complete with Mrs. Bettersen’s comments and grade, Chum’s hilarious outline, the “paper” itself, and endnotes that will baffle, please, and amuse in equal measure. 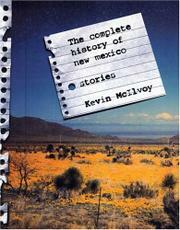 As for story, like the title says, there’s completely everything, all the real history mixed in with Chum’s own voice (“maybe there weren’t commas in those days,” he cites his father, and tells us later that “When there was first canned food in New Mexico was when people found God again”). But there’s even more: the death of Chum’s best friend, Daniel, and the disappearance of Daniel’s sister, Marty. By the end of the search for Marty, the reader will not only be moved indeed but will know much more about everything and everyone, including Mrs. Bettersen. The McIlvoyian insight and charm return, full force.